Once again, we asked our volunteers about their experiences heard very useful feedback. Take a moment to reflect on the information and guidance we received. You can also compare our end of year results to the survey taken at the beginning of 2015. On October 13, 2015, The Mountaineers sent a survey to 4781 people who volunteered with us in the past year (we have about 1700-2000 volunteers at any given time). This included people who volunteer with us as leaders, course instructors, committee members/branch administration, event support, help for our youth programs, the lodges, stewardship volunteers, Mountaineers Players and on the Board or Advisory Council. Why do we do this? Because we care. 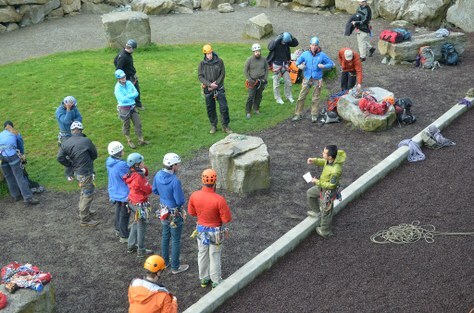 We want the experience of volunteering for The Mountaineers to be one you enjoy and value. You make our club a part of your life and we are humbled by that gift. We want you to take something positive away from the experience. As a volunteer-led organization, this information informs our volunteers as they make changes in their programs. Get in touch with us if you would like help developing a survey for your committee. Our account for leaders with SurveyGizmo has some powerful analytic and reporting tools we can help you with! In total, 488 people responded to the survey, giving us a 10% response rate and a statistically representative measure of people are feeling. It was a long, extensive survey asking about experiences as a volunteer. We can use it to compare to a previous all-volunteer survey earlier in the year to help us refine and tailor our programs with more success. 54.1% of them had volunteered as activity leaders. In the past 12 months, our volunteers reported a very high level of satisfaction, with the average score on a scale of 1-7 being a 5.8. In fact, only 14 people out of 372 respondents reported a satisfaction level of 3 or lower (below the neutral point of 4). Only 20 people (5.3%) felt their contributions as volunteers were not valued (and, if we could, we would call each one of you to check in and let you know you are appreciated). Most people felt their contributions were valued "most" or "all of the time" (69.1%) and 25.5% reported feeling valued only “some” of the time. We saw a 9% increase over the last survey in the number of people who felt their opinions were valued. This is good (although we'd like to push this even higher) and shows people are generally valuing the efforts and time they give to the organization, with feelings in this area moving in the right direction. More people said their satisfaction had increased over the past year (14.5%) than said it had decreased (9.6%). Everyone else reported that their satisfaction stayed the same as last year. Overall, volunteers reported feeling they knew what was expected of them in their role (88.1% of the time), with only 2.6% of people saying they didn’t feel prepared (10 people total). 85.9% said that they felt they had the tools and information they needed to do their volunteer jobs (2.8% said they did not). Promisingly, there was a 6% improvement in the number of people who reported having the tools and information they needed to perform their volunteer jobs. You can see how this brakes down based on whether you were looking to support from your committee, branch, staff, or the board in the complete report. We were also pleased to find out that there was a 10% increase in people who reported that they always knew who to go to for support when they needed it (from 46% to 56% in the past 8 months), with 92% of volunteers reporting they knew who to go to all or "most" of the time. 27 people felt they only knew who to ask for support "some" of the time and 4 people reported not knowing who to ask (email us at Member Services, we'll help you figure it out!). This is promising because it shows that we have increased awareness of how our organization's structure and governance works among our volunteer base. At the same time, however, 52.6% of volunteers were not knowledgeable about their branch leadership. Of those volunteers who did not know their branch leadership, only 16.3% thought it would be useful to have more interaction with Branch Leadership. 30.1% felt that their work was not affected by it. This may be a sign that many volunteers' needs are being met without having to access that level of governance. Please keep this governance model in mind, however, when working with your leaders and course instructors, especially when fielding their ideas for innovation and improvement. The typical happy (and challenged) volunteer will take on different roles in their "volunteer lifespan." In this survey, 64.3% of respondents reported taking on a new role in the past year and 27.6% said they stopped volunteering in one or more ways. This is natural - and healthy. But we certainly like seeing more people taking on new roles than moving away from ones they've had. Why did you take on a new role with The Mountaineers? Do any of these findings spur throughts on how we can better create meaningful volunteer jobs that people will enjoy and want to fill? Of the people who reported that they'd stopped volunteering in a specific role, the vast majority reported lifestyle reasons - which we respect and want to support as an organization. Most of our volunteers receive some sort of feedback from students and participants, helping them to evaluate and improve their efforts. The vast majority of volunteers reported this feedback made them feel good (81.2%) and/or helped them improve (33.1% of people also checked this box). There were still, however, 24.2% of respondents who reported receiving no feedback, which can contribute to a negative volunteer experience. If you were not aware, please remember feedback from participants has been systematized with respect to trips, courses, and events, which you can access through the activity and course histories in your profile. Just like in the last survey, our leaders overwhelmingly indicated they prefer "personal or professional growth opportunities" to other methods of thanks such as "praise and recognition" or "physical gear" (which, this time around, tied for 2nd place). 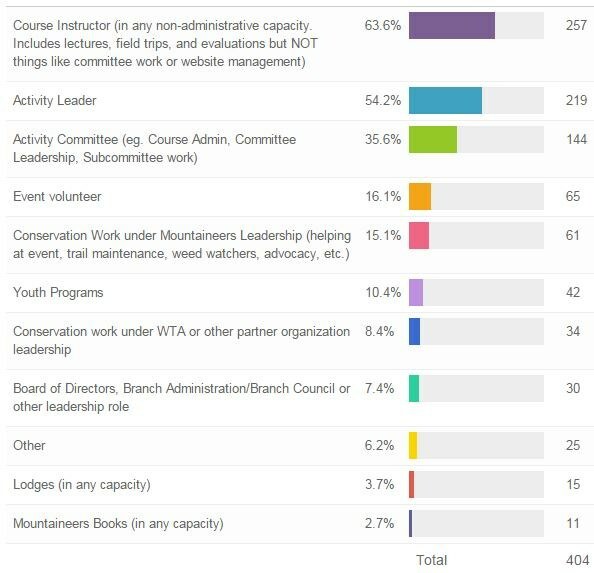 Since hearing this feedback in the last survey, we began dedicating resources to connecting volunteers with development opportunities like the Wilderness Risk Management Conference and encouraging committees to make similar investments such as Seattle Climbing's sponsorship of AMGA single-pitch trainings. Know of a great development opportunity for our volunteers? Please let us know! Our volunteers cross a wide variety of demographic markers. In general, they tend to be experienced Mountaineers, with 65.7% of those responding having 5 or more years of experience in the organization and 75.5% indicating they had taken 3 or more courses with us. Our volunteers trend more male (64%) than female (35.3%), a slightly higher difference than reported in February (60.8% compared to 37.3%). They are also overwhelmingly white (88.8%) and not representative of the overall Washington state population (80.7%) - especially in light of the fact that King County is only 70.1% white (where over half of our membership resides). I note, however, that there was a 1% decrease in the percentage of respondents who identified as "non-hispanic white or euro-american" this time around. When asking people what suggestions they had for creating a more welcoming/inclusive environment for under-represented groups in The Mountaineers, there were a wide variety of responses. However, the idea for doing this that got the most agreement from people was starting with youth. Sign up to volunteer with some kiddos today! 24.2% of respondents reported they received no feedback about their volunteer work. This can contribute to a negative volunteer experience and best practices would call for filling this gap in our volunteer programs across the organization. We encourage our Staff, Course Chairs, Committee Chairs, Branch Chairs and Board Members to think about meaningful ways you personally can provide feedback to your volunteers. Also remember that we have systematized making feedback available to leaders with respect to trips, courses, and events, which you can access through your activity and course histories in your profile. *Both of these metrics deserve important consideration and follow-up. In beginning to explore the causes, however, not all of the differences between these reporting categories were statistically significant (i.e. not enough people answered some questions in ways that gave us data we could reliably act on). So, for example, "support from branches or committees" was not clearly associated with these outcomes. In addition, volunteers from non-Seattle branches perceived a higher level of support from staff than Seattle volunteers. Many believe this means ALL people, not just the people who show up at our doors. We must remain on guard against subconscious prejudices we aren't aware of and the micro-aggressions that can result from them (for example, "did your husband get you into hiking?"). Everyone has some biases, whether they want them or not. We must strive to be aware of them so that we ensure a welcoming environment for an increasingly diverse American population to access and support the outdoors through our programs. There were a number of responses indicating some members are just unaware of the many different programs we offer across the organization. For example, one respondent suggested that "hiking" was beneficial and we should begin a "hiking program." Other similar examples illustrated the need to improve communication across the membership. These are some of the most obvious trends and points revealed by the, very large, survey results. We encourage you to study them further by looking at the full report and diving down to the level of work that your committee does so you can understand the ways you can focus your efforts more effectively. We thrive in a culture of constant improvement and depend on your contributions to the greater organization. This survey provides a high-level view of the state of our volunteer culture, and it should help guide us to questions that warrant further investigation. What questions does this prompt for you? What would you like to learn more about and dig a little further? Do you have follow-up questions you'd like to ask your branch or committee? Our account for leaders with SurveyGizmo has powerful analytic and reporting tools we can help you with! Thank you again - your efforts make a huge difference to our students, participants, and - hopefully - yourself!